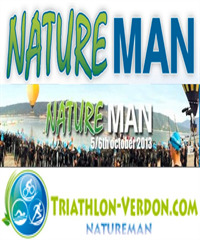 The swim will take place at Sainte-Croix, leading to the bike course of one 25 km loop, and return to "Les Salles-Sur-Verdon's village, and a second loop of 65 km with several view point that are worth visiting to best see triathletes. the run is on a "nature" trail, that goes along the Sanite Croix lake at the begining, before it goes up again on the tracks heading to the ancient Bauduen track. The track is very recreational with some small technical parts, the athletes will have the occasion to cross each other diferent times, like between kilometers 4 and 9 near by the "CLos des Rouvie...rs".